Whilst researching images for my study, I found with depressing regularity a trend for incorporating photographs of women who have been subjected to physical abuse, with vigorously-expressed sentiments of victim-blaming. These are not niche images, but appear widely across social media. Their purpose is clear – to intimidate the viewer, directly regulating behaviour under the threat of violence. The text speaks as if directed at the victim, or potential victim: “you don’t deserve him”, “shut it”. Otherwise, it acts as if to elicit support from the viewer, suggesting that she did something to deserve it: “she broke my heart”. To avoid being the victims of such violence, the viewer is instructed to heed the warnings: don’t speak, don’t upset him, tolerate his behaviour at ‘his worst’. There is a deep rage that is expressed through these images – an anger at the victims for what is presented as their problematic behaviour. 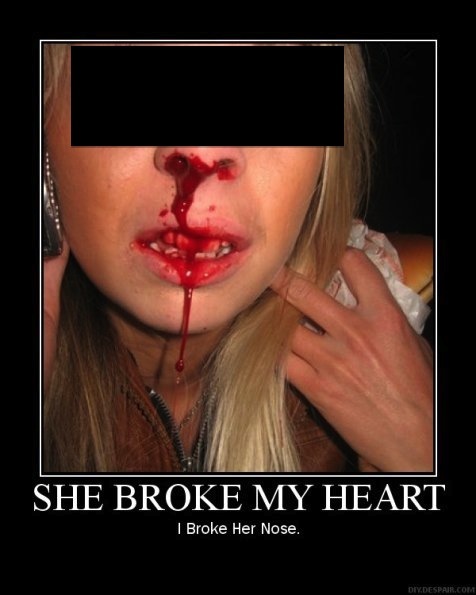 The catalyst – ‘She broke my heart’ – results in an assertion of superiority – “I broke her nose” – which serves to re-establish the dominance of the male voice. This unequal power dynamic is further expressed in the caution to not speak when men are talking, and the reprimand to behave in a way that ‘deserves him at his best’, via accepting whatever might constitute ‘his worst’. These images, therefore, exemplify a vigorous caution to not challenge the status quo – to be passive, to be quiet, and to be accepting. The penalties for failing to meet these criteria are made explicitly clear.